A lot has happened globally in the last few weeks that makes me weary about the growth of the financial markets over the next 1 to 2 years. Inflation in France sparked violent protests. The U.S. federal budget deficit for fiscal year 2019 is projected to be nearly $1 trillion. It will be hard to find borrowers who are willing to buy all those treasury bonds. The 2 largest foreign holders of existing U.S. debt are China and Japan. And both have become net sellers. The economic tension between the U.S. and China is momentarily on hold, but 3 months from now the trade war could escalate. Financial markets are stretched thin. The S&P 500 is still trading relatively expensive at 22x earnings, even after the pullback that started in October. There isn’t much room for growth in equities. Real estate markets around the world are softening. U.S. home building company Toll Brothers warned that the housing market slowed further in November, particularly in California. Home prices and sale volume in Canada, particularly in Vancouver and Toronto are going down. Prices will likely fall further into the upcoming spring. But Canada’s continued trade deficit and high energy prices mean the cost of living will probably climb higher. The theme for 2019 could very well be higher inflation but lower investment returns. If that turns out to be true then I would prioritize paying down debt and acquiring hard assets. You took some big positive step when you switched you margin accounts to Interactive Brokers. The margin rate difference is huge. Playing it safe with cash on hand is very safe. I think we are headed into a recession. I agree. A recession does seem to be looming on the horizon. A yield curve inversion between the 2 year and 5 year U.S. government bond just happened. Bond investors must think that interest rates will fall in the future. I remember when I first switched over to IB and the margin interest rate was only 2%. 🙂 That was great. With all the rate hikes on both sides of the border my Canadian and U.S. margin accounts now charge about 3.3% on average. It’s not high enough for me to stop using margin entirely, but I have decreased my margin debt from a couple of years ago. Veggy prices will go up more than meat when we’re a nation that ought to be eating more veggies in the first place. 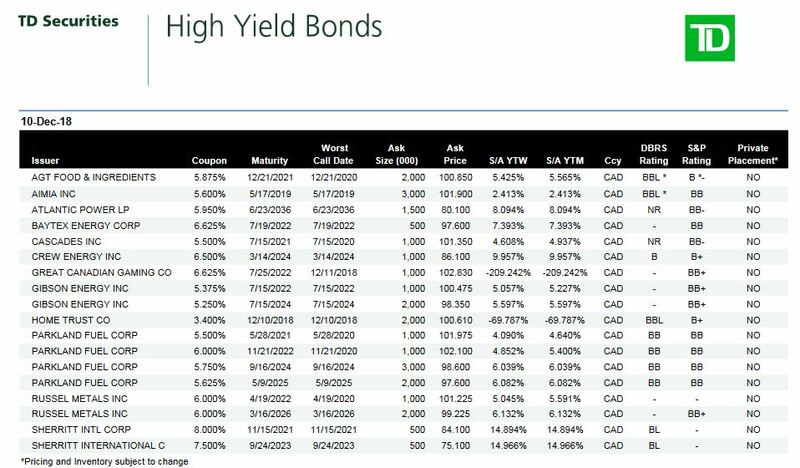 What happened to your high-yield bonds (Baytex, Sherritt, and Western Eng)? All my bonds are in my RRSP account to maximize tax savings on interest income. So in my net worth statement, Baytex and Sherritt bonds are part of the line item: Retirement = $117,400. My Western Energy bonds got called earlier this year so I no longer have them. But the Baytex and Sherritt bonds ($5,000 face value each) are still performing as expected. Coupon payments are made semi-annually. No late payments so far. Here’s their latest market value, which hasn’t changed much over the years. Is TD your broker? Is that price–$96 for Baytex–the bid or the ask? Questrade is selling that Baytex bond at $97.625 (7 Dec 2018 ask price), and that’s a significant difference! I think the $96 price in your investment summary is the ask price. There are 3 ask prices: investment summary ($96), bond bulletin ($97.6), and intraday quote from the bond desk. Those 3 prices are usually, if not always, different and may be given by different sources. The only price that matters is the intraday quote (on which avg cost is based), and the bulletin price is the furthest off, so the bulletin is not an accurate source of prices. You’re right. The market price in your investment summary is the bid price, but not just any bid price — it is the bid price without TD’s commission, which is $0.40 per $100 of face value. The actual bid & ask prices with commission were $95.60 and $97.55 respectively, which is consistent with their bond bulletin at that time. When you first wrote about Baytex bonds 2 years ago, your account showed qty 5000, avg cost $0.99 (book value $4925). Today, it shows qty 5000, avg cost $0.96 (book value $4792.50). Why the difference in avg cost? That’s a good observation that I hadn’t noticed before. Funny how the book value changed. I’m not sure why. Either the first quote 2 years ago from TD was wrong or something happened between the and now. I’ll keep an eye on this and see if it changes again next year. You will find that there will line to purchase the reasure bonds. Canada on the other hand is in pickle with Chinese comrads and unless something is done, there will be some unpleasant consequences to come. I think 2019 will be an opportunity. I wish I had more cash now to poor into the US market, it will be bounce back, but it will be a roller coaster. I feel like Canada’s in between a rock and a hard place. We want to side with the big bully on the playground so we don’t get picked on by the bully. But at the same time others will associate us with that bully and throw shade at us lol. Can be said about pretty much every white politician.